We are proud to display the "Hot Alaska Site" Award! Thank you for this prestigious award, WWW DPS Hot Site of the Net! We would like to thank the folks at the Hudson County Sheriff's Office (NJ) for giving us the Gold Tin Award for 1996. It is honor to display their award here! We appreciate their recognition for all the time and effort that went into creation of this site. We also encourage you to visit them and let them know how much you appreciate them, too! Thank you to the fine folks at Starrcraft for their "Elite Touch of Class Award!" This award is given to websites displaying: " 'A Touch of Class' within their pages, offering good reading material or something worthwhile to their visitors!" We would also like to thank the fine folks at the Emergency Resource Directory for selecting this site for December, 1996's "Way Cool!" police agency on the Net! 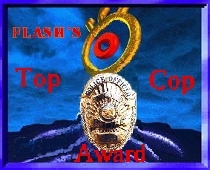 We are proud to display the "Top Cop Award" given December, 1996! This site designed and maintained by Greg Russell. Please send any comments or questions to the Page Master.